Jeremiah: Paul Denlinger of Beijing is an internet expert on China, and I’ve offered him the opportunity to help share from an insiders perspective. Keeping in the theme of internet strategy and how the web impacts business, (and in this case the world) Paul, a resident of China, shares his perspective. Although a long post, please show him the same respect that you do for me. The Sichuan earthquake of May 12, which first registered as 7.8 on the Richter scale, has now been revised upwards to 8.0. As of Thursday May 22 in Beijing, the number of fatalities has so far reached more than 52,000, missing are 30,000, while injured are 400,000 and the number of homeless has reached 5 million. The final death toll is projected to be around 72,000. The Chinese government has appealed to foreign governments for aid and assistance, and Russia, Japan, South Korea, Singapore, Taiwan and Hong Kong have all sent teams to aid in the search for survivors in the rubble, and for body recovery. With the huge number of refugees, there is also a severe shortage of tents to house them, and many foreign governments including the US, UK, Russia, Germany and Italy have all sent cargo aircraft to Chengdu, the nearest major city, to drop off needed supplies. The Chinese government reacted swiftly to the tragedy, with Chinese premier Wen Jiabao flying to Sichuan the afternoon of the earthquake. He won wide praise for his swift action, and was photographed and taped talking and holding newly-orphaned children, telling them that the government would care for them, and would be committed to helping them rebuild their lives. He was photographed weeping when the bodies of two young children were removed from the rubble of their collapsed school. After several days of non-stop work directing rescue teams, making sure that they got all the help they needed, the exhausted Wen returned to Beijing, and was replaced by Chinese president Hu Jintao, who in one of the more memorable scenes, was seen holding an 8-year old boy, and telling his family that the government was committed to helping them rebuild, and to finding the bodies of their loved ones. Military rescue teams from the People’s Liberation Army (PLA) were dispatched from all of China’s 31 provinces to aid in the rescue effort. The first two days after the earthquake there was heavy rain in the area, and in a few instances, paratroopers were dropped into stranded villages to help the local inhabitants. In one instance a dangerous night drop was made into an isolated village, and the mission was so high-risk that the 15 men were required to write their wills before departure. There continue to be mudslides in the area, and the government says that so far more than 200 volunteers have been killed in mudslides, trying to get supplies to the villagers. The earthquake struck in a mountainous region of Sichuan, at the foothill of the mountains which run to the west and become the Tibetan plateau. A mix of Han Chinese and ethnic Tibetans live in the area, mostly in small villages surrounded by mountains. The main earthquake struck at 2:28PM, and an estimated 7,000 school classrooms collapsed. Schools were particularly hard-hit since many of the primary school students were taking their afternoon naps, or had just started their afternoon classes. There are many stories of children escaping from their classrooms to their sports field, only to be buried alive when the mountain surrounding the school collapsed on them. For many of their families, their bodies will never be recovered. In other instances, parents rushed to their children’s schools to dig out their children, only to find them dead. In some of the more horrifying stories, the quake was so severe that mountains which were separated by valleys with villages in-between moved together, completely obliterating the villages and their inhabitants. In most of these village households, three generations of families live together, including grandparents, children and grandchildren, as is the usual Chinese custom. In many of the households, the parents of the children are migrant workers in Shanghai, Beijing and the more prosperous cities of China’s east coast. Upon hearing of the tragedy, and being unable to connect with their families on their mobile phones, they took trains back to Sichuan to search for their families. Many returned only to find that their whole household had been wiped out, or to find that their only child had already been buried in a mass grave. In some cases, there was a single survivor, with no surviving relatives. Most of these people were severely injured, and on learning that their families had been wiped out, said that they too wanted to die. But then something curious started to happen, something which hadn’t happened before in Chinese society. Strangers started going to hospitals in Chongqing and Chengdu, and started caring for people whom they were not related to, effectively adopting them. All during last week, the news started to spread, not only of the need to send supplies, but also to care for the survivors. Stories of this kind spread quickly though China’s officially-controlled newspapers and television, and spread even more quickly on the Internet, especially Chinese BBSes such as Tianya, which are the most popular community tool for unofficial news. Other popular outlets for information are Twitter and a Chinese version of Twitter, Fanfou. The most popular IM client in China is QQ, which has more than 500 million registered users. The news spread very quickly about the scale of the disaster, and strangers started organizing themselves online to take supplies to the disaster area. Google China and Baidu, China’s leading search engine, soon created specialized searches for relatives. Then on the weekend of May 17 and 18, some Chinese started designing online memorial sites where visitors could sign a book and give a white flower in mourning for the earthquake victims. These sites were designed and set up by volunteers without any payment from the government or corporations. As of May 22, one site had more than 262,000 unique visitors. Late on the evening of May 18 Beijing time, the Chinese government announced that there would be three official days of mourning, from May 19-21, and recommending that game and entertainment sites shut down during the mourning period. Robert Scoble interpreted this event out of context and turned a human tragedy into a political event, narrowly framing it in terms of politics and human rights, and suggested that this meant that the Chinese government was enforcing a government crackdown during the mourning period, as could be evidenced from his comments, and those of his followers, on his Friendfeed account. In fact, the Chinese government’s Central Publicity Department, which is in charge of content on the officially controlled media, was playing a catchup game with China’s Internet population, which is now the largest in the world, as well as the general population of China. As people learned more about the scope of the tragedy, they wanted to do more, and even more, the government sensed that they needed a public outlet to channel their grievance. The problem was that, in China’s long history, there never has been a defined way to remember and mourn ordinary citizens who have been killed in an enormous natural disaster. For this reason, the government prescribed that all cars and citizens would stop where they were on May 19 at 2:28PM, exactly one week to the day from the time of the earthquake, and while air raid alarms sounded, they would stand still for three minutes. They did this on Monday, as can be seen in this Youtube video and this interesting account of the event. Many websites have voluntarily changed their colors to black and white during the mourning period, while some have added the Chinese character for "mourning" to their websites, and many Chinese have chosen to wear black and white during the mourning period. All of this has been done without government orders of any kind; it has all been organized on the Internet through BBSes and people who voluntarily spread the message. Many other sites have set up donation badges to facilitate online donations to help organizations, and there have been blood drives as well. There have also been a few sites, including Google and Baidu, which have created people search sites, so that relatives can look for their loved ones. Most newspapers and magazines, all of which are controlled by the government, have moved to publishing in black and white only. While younger Chinese have turned to the Internet, older Chinese have devoured huge amounts of TV programming and newspapers, all of which are state-owned and are now fully devoted to reporting the aftermath of the disaster. Unlike in the past, all of this reporting about the disaster is what the audience demands from the bottom up, not what the government wants to give to the people in a top-down fashion. In order to show the people that the government is on top of things and doing its job, state-owned news agencies have been working round the clock to provide news about the situation in Sichuan. When not reporting about rescues, stories detailing the amount of goods and supplies being sent to Sichuan from the various cities and provinces of China form a solid wall of disaster reporting. In keeping with the Chinese affinity for numerical data, precise numbers of boxes sent, trucks dispatched, tons of supplies sent, trains sent, etc. are all reported in these stories. In contrast with the past, Chinese government officials have promised a higher degree of transparency and accountability to the people. Many Chinese have also started openly asking questions on the Internet and on television and radio, including why so many schools collapsed, and if dams in the region may have caused soil erosion. Whether it is television, print or the Internet, there are endless stories of people living just because they ran a different direction from the rest of their family, or because someone left home on a shopping errand, only to find their home flattened and all their family killed by falling debris. Ever since the end of WWII, China and Japan have had a rocky relationship, but the dispatch of Japanese rescuers to aid the rescue process, has won significant praise and goodwill from Chinese netizens. Maybe most interesting has been a publicly-driven drive for corporate donations of money and supplies to the earthquake victims. Sina, one of China’s three leading portals, has set up a corporate donation page which lists amounts Chinese corporations have given (minimum amount for listing: 10 million yuan or US$1.4 million). As of the afternoon of May 21 Beijing time, total corporate donations listed on the page had come to 5.58 billion yuan or US$797 million. On the Chinese Internet, netizens have been especially loud in driving corporations to donate more, and in some cases, have publicly attacked corporations for being too cheap in their donation amounts. In most cases, the criticized companies have quickly upped their donation amounts in reaction. Corporations have also looked sideways to see how much their market competitors have donated, and have matched or trumped their donations, sometimes setting off donation bid wars to win praise from the public and favorable PR. For the past ten days, Chinese have spent most of their time glued to their TV sets or on the Internet, collecting every scrap of information about this huge human tragedy. The outpouring of emotion has been enormous. As the mourning period draws to a close, the next phase will begin, that of reconstruction. Without a doubt, the Chinese Internet will continue to play a major role. Paul Denlinger is an Internet consultant based in Beijing who publishes his own blog at the China Vortex. I use my blog, (and other social media tools like Twitter) as a percentage of my research methodology (around 15%), it’s not the only contributing factor but is an effective way of me using a real-time, global, inexpensive user group. While I do benefit from the flexibility and speed of this format, it also has it’s risks such as lack of identification, biased sample, or often lack of controls. Forrester encourages me to use these tools, it’s helping, and I’m living the space that I cover “Social Computing”. Social media is only one small sliver of the methodology used to generate the reports. I’m working on two research reports, the first one is a catalog of the White Label Social Networking vendors (it will list out all the players) then I’ll be segmenting, rating and ranking the leaders in the space by creating a Forrester Wave report. The Wave is a very heavy duty report, and will take me at least 10 weeks to complete, it’s very thorough and will influence buying and funding behavior of the market. Whenever I ask you for help or conduct research in public, I’ll return the favor and give my findings back to the community, it’s only fair, and encourages you to participate, it’s dang fun too. Earlier, I asked me readers (who I know many are in the market for social networks) what do they want in a white label social network vendor. 2) The weighted results are now available. The number represents a weighted score, as respondents were asked to prioiritize only three requests, the first response was weighted at “3” the second weighted a “2” and the third response weighted a “1”. Quite a few responses around functionality to have a great user experience, be easy to use. As the term “white label” applies (an application you can rebrand and reshape) there’s no surprised that respondents wanted a software package that could easily morph into the look and feel of your corporate site or microsite, we could have easily coupled the 4 results for flexibility in the bucket, if we had a forced drop down survey, (this was open ended, by design) Lastly, pricing was important, as you know the vendors go from free to 20,000 a month, installation services range from 5,000-200,000 fixed costs with varying degrees of service, support, and software features. Many strategists made it very clear that they work at Fortune 5000 companies that reliability was so important, as many brands sell performance based products, their community site could not be down, it’s just embarrassing. Thanks for responding, although this is only one factor in determining requirements, it’s certainly a good kickstart, and great confirmation. As an analyst, we undergo training then are put to the test to stand by our calls, and back it up with data, insight, experience, or facts. I found this diagram published by the create debate blog, and by using the creative commons license they have on their blog, am sharing it with you. The graphic is spurred by the essay written by Paul Graham How to Disagree, start there. Refutation: I’d like you to reconsider your advertising-popup tactic, as most users don’t like them, in fact Treester Research shows that 26% of those who see popups actually have a negative brand impression. Caveat: I’m not slamming the pop-up marketing industry, this is just an example, I could have used blogs too. I remember as a child, the school yard arguments were often at the bottom. Sadly, some bloggers and tweeters are still there. When you talk to executives, I recommend you focus on the end objectives and end results, never on the tools, which moves lower and lower on the pyramid. 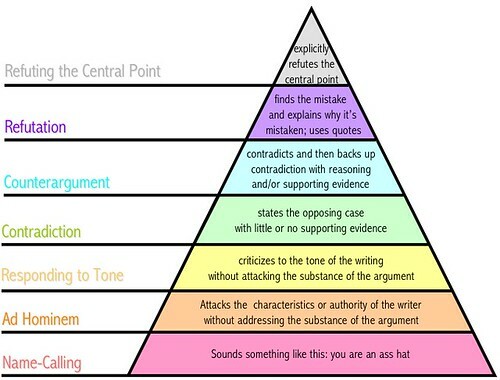 So, back to you, what point on the pyramid do you insert your arguments? Be honest, and talk about how you can improve or give an example. Just got back from meeting with an executive recruiter, no, I’m not planning on leaving Forrester, I was helping a friend, as well as doing some research about social media skillsets. You see this recruiter (he’s left a comment, and his name is Matt Raggio, you can reach him on his website) finds executive talent for social media startups here in Silicon Valley. He’s well connected to the VC community, and knows when leadership teams need to be built out. See the challenge for many companies right now is that social media is a very important aspect of marketing, especially if your company is selling soical media products, services, or software. While the traditional forms of marketing don’t go away (advertising, lead gen, email marketing, website, SEM, event, and product marketing) they are all enhanced, impacted, or disrupted by social media. Furthermore, a VP of marketing at a social media company really needs to demonstrate that his own firm has some expertise, if not mastery, over the very medium they are offering. If finding the right mix of marketing resources wasn’t hard enough, there’s a gap between the Marketing Immigrants often the traditional marketers who use the same play book year after year and the new social media marketing folks, often young, masters at the tools, but lack business experience. While the Social Media Immigrants may be entrenched and comfortable in the old ways, they often lack full understanding or the ability to do social media effectively, over planning, stiff messaging comes across un-authentic. On the other hand, the natives grew up or are familiar with these tools, yet they lack the ability to define, reach towards, or meet business objectives, or manage a profit and loss. So you see the dilemma, finding these marketing leaders in the world of social media is a challenge, the right balance (at least in these early days) are hard to strike, and the often successful are very happy where they are. I learned a lot from him, he gave me some pretty raw career advice, but I exchanged my knowledge too, I also told him some local haunts and events he should attend to find leadership talent. I also suggested he learn how to use Facebook to increase his network –and maybe even market the jobs using social media tools. What do you think, is it easy to find a VP of Marketing that gets both worlds of natives and immigrants and do an effective job? When I first read the Cluetrain manifesto, it got my excited. I actually printed out the 95 Theses and left them on many of the marketing leaders chairs at my office at Hitachi Data Systems. The content was very revolutionary, so I actually never told them that I was the one that printed it out and parachutted these 95 soliders onto their desks. Since they read this blog, I guess they now know. 10 years later and the book is still going strong now (and it’s available for free), Shel Israel suggests (and I agree) that it’s the first in a trilogy of books: Naked Conversations, and now Groundswell. I was around during the launch of Naked, and was given permission to buy over 60 books for my colleagues at HDS (I guess the paratroopers did their job), and was at the book launch at Arrington’s house, and got to know Shel really well, and eventually worked with Robert. Now, I’m sitting right next to Charlene, and work with Josh frequently, it’s a real blessing to follow my passion. The Conversation Group (social media strategists) have put together a great event, remembering Cluetrain after 10 years, in fact they’ve a blog dedicated to the tour, and I’ve asked to be one of the presenters, quite honestly, it’s a humbling offer, thanks. I hope you attend too, you can register for “There’s a New Conversation” Thursday, May 29, 2008 8:30 am PT – 8:00 pm PT, Palo Alto, CA. My discount code is friendoftcg and it totals the event at $75 / person including breakfast, lunch, and cocktail reception afterwards. See you at There’s a New Conversation!